Preheat oven to 375 F. Combine cornbread mix, egg and butter in a bowl, and mix well. Add remaining ingredients and combine well. Mixture will be thick and lumpy. 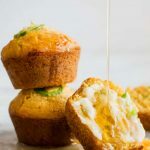 Place cornbread in a greased muffin tin (makes 6 muffins). Bakefor 15-20 minutes or until golden brown. Mack, the world system is what it is. Institutions, systems, ideologies, and all the vain, futile efforts of humanity that go with them are everywhere, and interaction with all of it is unavoidable. But I can give you freedom to overcome any system of power in which you find yourself, be it religious, economic, social, or political. You will grow in the freedom to be inside or outside all kinds of systems and to move freely between and among them. Together, you and I can be in it and not of it.